Measurements are 48" by 48" by 14" deep. Also known as 1/2 face cord. This rack assembles with only eight bolts (included) and is great for garages, porches, or that spot on the patio or deck. Like all of our racks, it has a black, powder coat finish, Arc welded end sections, our 10-year structural warranty, and includes the cover! INCLUDED COVER: Our own unique design covers firewood the way it needs to be covered! They keep the top completely dry and ready to burn, and allow for air to flow through the firewood to reduce mold and mildew and promote curing. All of our covers fit around the 4 uprights of the rack and move down as the wood stack gets smaller. The cover is made out of top quality coated canvas, and has velcro front sides for quick access to your firewood. 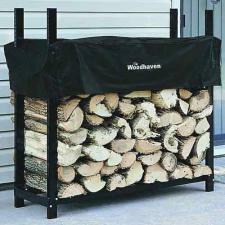 Covers wood up to 24" in length.